Frisch's lovers will finally be able to ask for a Coke without being asked if a Pepsi is OK instead. 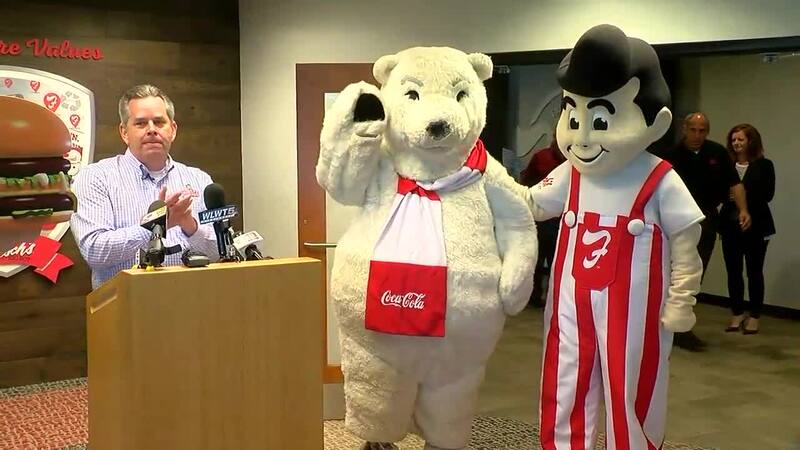 Frisch's CEO Jason Vaughn announced Monday Coca-Cola will be back by September after years of public outcry. The move to bring Coke back has been “one of the most requested” items by guests, Vaughn said. He said the decision to bring back the beverage was a nod to Big Boy’s heritage. 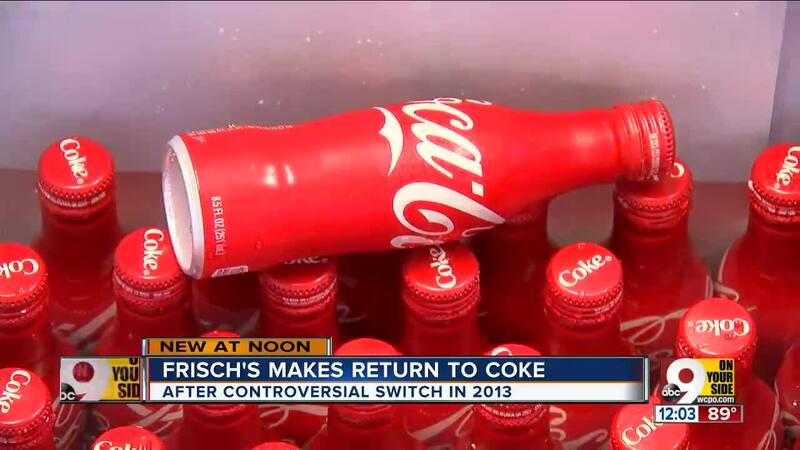 Vaughn said the return of Coke will help Frisch’s stay relevant. The Cincinnati staple opened a contemporary location Downtown earlier this month after a 14-year hiatus. “We did that with the principle with listening to our guests … we were gonna do what our guests asked us to do, and today is no different," Vaughn said. Frisch's stunned many of its customers in 2013 by signing a contract with Pepsico Sales Inc. that was scheduled to last until November, 2020 or until Frisch's bought "an agreed upon number of gallons," according to a 2013 securities filing. 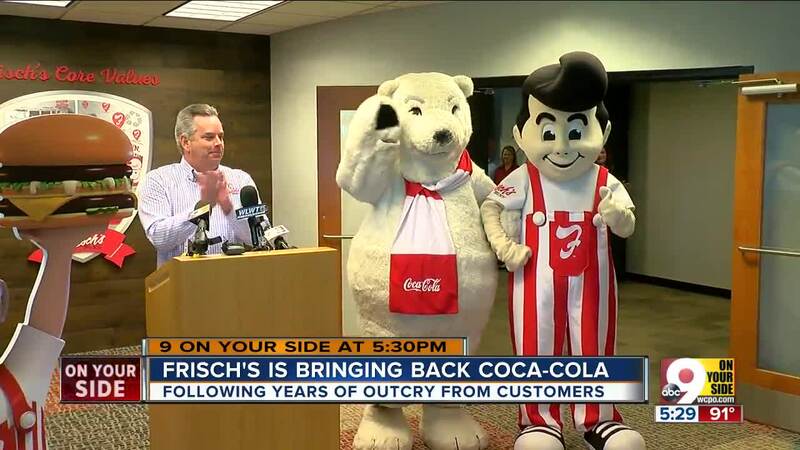 When Atlanta-based NRD Capital Partners announced plans to buy Frisch's in 2015, customers immediately started speculating on social media that the deal would restore Big Boy's ties with Atlanta -based Coca-Cola Co.
New owners often take a fresh look at their supply chains and Frisch's 121 locations are definitely a big enough prize for soft drink rivals to chase with rebates, pricing discounts and other incentives, said Dean Small, CEO of Synergy Restaurant Consultants in Newport Beach, Calif.
"These guys have been at each other the last 50 years," Small said. Both Coke and Pepsi have been known to "offer a broad range of incentives" to get customers to switch. Sometimes the perks reach "upwards of $1 million," he said. Frisch's wouldn't say whether the Pepsi deal is ending early or whether Coke offered incentives to reclaim the contract. "It's a multi-year agreement," said Frisch's Marketing Vice President Todd Napier. Coke will supply five products - Coke, Diet Coke, Coke Zero, Sprite and Mellow Yellow - along with syrups that Frisch's employees will blend with vanilla, chocolate, strawberry and cherry flavoring. In other words, Coke won't be installing self-service machines where customers blend their own flavors. "We anticipate serving those (proprietary flavors) in partnership with Coca Cola and our magic pellet ice," Napier said. The blockbuster change is the latest in a series of changes at Frisch's this year, all of them driven by customer feedback and a desire to pay homage to Frisch's heritage as a Cincinnati-based restaurant chain. "We brought back crinkle fries," Vaughn said. "We went back into downtown for the first time in 14 years." Frisch's is gradually updating its restaurants with a remodeling program that will reach 35 stores by next May. And it revised its menu three weeks ago with the addition of a veggie burger that's generating more than 1,000 orders per week. Five weeks ago, it removed 20 percent of its menu items, including a pork tenderloin sandwich, various meat loaf offerings and the reuben sandwich.